The new Charlton home shirt for next season was first viewed on the final day of our last league campaign, both on the pitch as worn by the Red Devils (the parachute regiment display team, not a West Sussex football team) and also on display in the main reception after the match. Other than the club badge and Nike's 'swoosh' logo (is that what they call it?) you could have been forgiven for thinking it was just a slightly dark red polo shirt. Well nothings changed other than the addition of a sponsor. Yesterday local south east London firm Andrews Sykes were announced as the new club sponsors signing a one year contract. The home shirt has Andrews Air Conditioning emblazoned across it, the black away number we are told will display another aspect of the company. "The Andrews brand offers six core product areas: Andrews Air Conditioning, Andrews Heat for Hire, Andrews Dehumidification, Andrews Chillers, Andrews Boilers and Andrews Ventilation." Don't count out Sykes Pumps as a possibility though, but it does leave you feeling another word is missing off the end! To be honest it looks a little too local to me, almost in a non league kind of way, but at least it will stop people always asking me what krbs stands for! I'd always prefer a shirt with no sponsor just as it always used to be but those days are behind us. My new preference of Fullers Brewery paying us to have their London Pride logo on our chest and the corresponding beer available to purchase on the concourse fell on deaf ears so i guess Eric Andrews Sykes will have to do! It is of course the team wearing the shirt that matter so the mixed reception to it's design is a small matter. This new board are turning this club around and all decisions thus far have been to our benefit so I'll certainly trust them on accepting Andrews Sykes offer, especially in a financial field i have little to no experience in. We still wait for details of the shorts and socks to match the shirt but like it or lump it, we'll only have one season to endure it. Apart from the fact Nike took our business too late in the day to be able to offer us every design possible from their extensive collection, it is likely now with a big brand manufacturer we'll change it every season anyway. We are one of the last clubs to keep kits on the two year cycle. Norwich City recently hit the news in following suit with other big clubs in changing design every campaign. At the time i thought it rare and a little unfair on the supporters, but having chatted to John Devlin of True Colours fame, this has become more and more the norm. Have a play on the club section of the Historical Kits website. You'll find very few English sides of our stature that keep a home kit for more than one campaign. 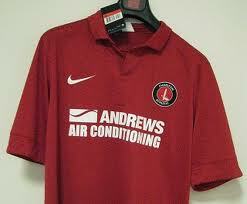 At least it's still red, the club badge hasn't changed and we're still called the Addicks. Imagine if these new owners were Malaysian! Cardiff fans, you have my deepest sympathies.